Doors are pretty average things in a house, and so are walls for that matter. Most of us analyze paint cards and paint samples with great attention, and think long and hard about paint colors for walls…why not for doors? I’m a big believer in making any ordinary “bone” of a house, as un-ordinary as humanly possible. If you’ve got to look at anyway, make it art! One really easy way to do this, is to not overlook the doors! I knew I was going for white walls and trim through the entire house. I wanted the doors to the main rooms (not closet doors) to break up all the white, and to contrast sharply, so I went for black painted doors. Here is a shot of the front hallway in my house before I painted it. A black door looks sharp, rich, and classic. Of course I left the under stair closet door white, because I want that door to blend in with the wall. Here’s another example of my entry, which had an ugly brown color on the inside. And some paint later…it actually looks like a nice door! This is a hugely simple way to make even a cheap, standard grade door appear nicer than it actually is. 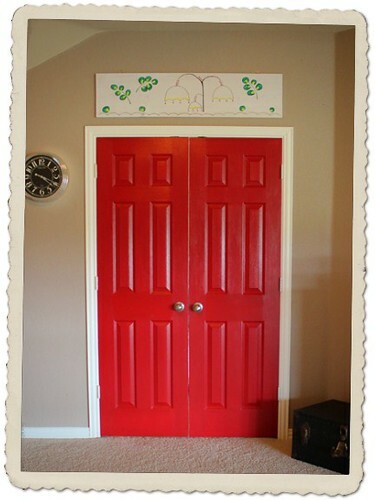 Painting doors is very budget friendly too, one gallon of paint will easily do all the doors in your house. If I get a hankering to paint all the doors green next year (and I might! ), I can do it without braking the bank over it…great news for my Mister! Painting a door doesn’t require any crazy skills either, it’s perfectly doable for us non-arty types! I don’t take it off the hinges or anything complicated like that. I just cut it in with a paint brush, then I use a mini roller do the rest. Watch out for drips at the corners if there is a design on your door! 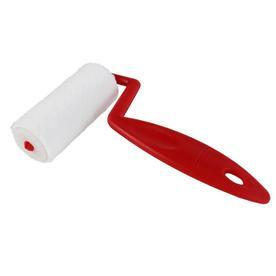 This is an example of the roller I would use for this type of project. 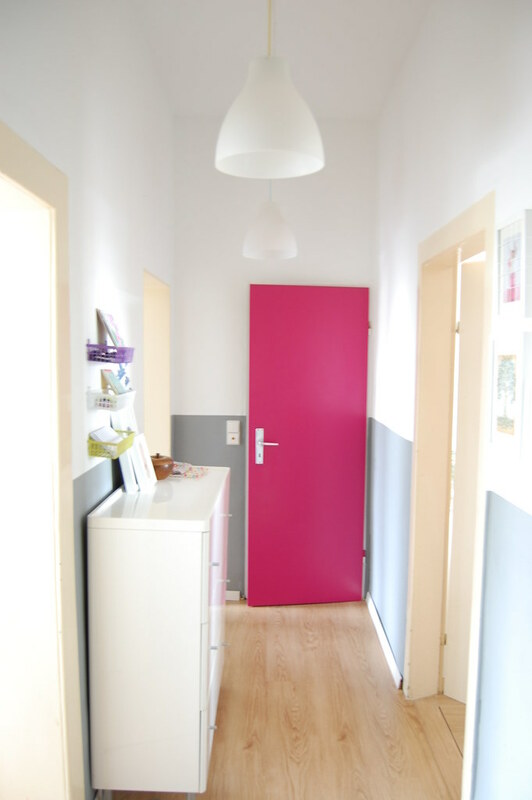 Painting just one door a different color may be just enough to completely change the feel of a room. Have you ever tried painting a door in your house? Did you love it? ***Updated 6/4/14: The stairs have been painted! See their beautiful new look HERE. Tagged black doors, black interior doors, black painted doors, painting doors, painting interior doors, tips on interior door colors. Bookmark the permalink. I painted my hallway doors (all six of them!) black this spring and I love it! It’s amazing what a difference it makes. The outside doors are all red. The color looks so sharp against the tan walls and white trim. I regret not doing it sooner. I have honestly never thought to paint the interior doors but now that I see yours I want to. I am planning on painting the walls so why not do the doors too. I really love the black painted doors that you made .Black doors with white walls is really looking very nice . I have painted the main entrance door of my house with black color and it has really given a sharp, rich and classic look to my house. I just love your black doors. Those are looking different but awesome. I also want to try black to make my doors more beautiful. Looks great! What did you do about the hinges and doorknobs? I can’t imagine painting nicely around those! Really love the style. What made you decide to paint the stairs?